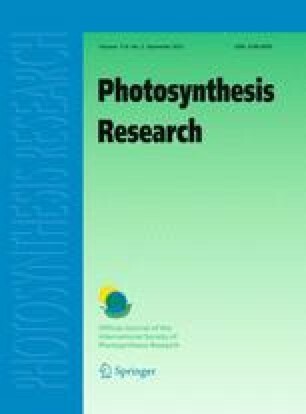 While light is the essential driving force for photosynthetic carbon fixation, high light intensities are toxic to photosynthetic organisms. Prolonged exposure to high light results in damage to the photosynthetic membrane proteins and suboptimal activity, a phenomenon called photoinhibition. The primary target for inactivation is the photosystem II (PSII) reaction center. PSII catalyzes the light-induced oxidation of water at the oxygen-evolving complex. Reactive oxygen species (ROS) are generated under photoinhibitory conditions and induce oxidative post translational modifications of amino acid side chains. Specific modification of tryptophan residues to N-formylkynurenine (NFK) occurs in the CP43 and D1 core polypeptides of PSII. The NFK modification has also been detected in other proteins, such as mitochondrial respiratory enzymes, and is formed by a non-random, ROS-targeted mechanism. NFK has been shown to accumulate in PSII during conditions of high light stress in vitro. This review provides a summary of what is known about the generation and function of NFK in PSII and other proteins. Currently, the role of ROS in photoinhibition is under debate. Furthermore, the triggers for the degradation and accelerated turnover of PSII subunits, which occur under high light, are not yet identified. Owing to its unique optical and Raman signal, NFK provides a new marker to use in the identification of ROS generation sites in PSII and other proteins. Also, the speculative hypothesis that NFK, and other oxidative modifications of tryptophan, play a role in the PSII damage and repair cycle is discussed. NFK may have a similar function during oxidative stress in other biologic systems.